Three bones make up our elbow joints, and the way they work together is what allows us to bend, straighten, and turn our lower arm (or forearm). The bone in our upper arm, going from our shoulder to our elbow, is called the humerus. the ulna goes from your elbow to the little finger side of your wrist. It acts like a hinge in your elbow, letting you bend and straighten it. Broken elbows are common in children – they account for about 10% of all childhood broken bones. Children take part in many activities that put them at risk of falling and injuring their elbow, such as playing on jungle gyms, sports such as gymnastics or football, and activities such as skateboarding or cycling. Toddlers can break their elbow falling from a lower height. 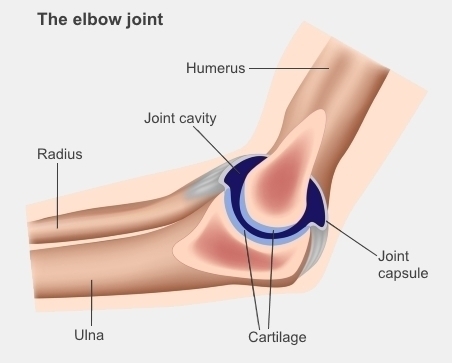 Usually a broken elbow is caused by a child falling onto an outstretched arm, falling directly on to their elbow, or by a direct blow to their elbow. Wearing protective elbow guards and pads during risky activities can help to reduce the risk of a broken elbow. How do I know if my child's elbow is broken? an inability to straighten their arm. If your child complains of a sore elbow after a fall and can't or won't move their arm, it's important to see your GP or after-hours clinic. Your doctor or nurse will ask you questions about your child's injury, examine their elbow and take an X-ray to find out which bone is broken, and how it broke. Sometimes broken elbows in children can be difficult to see on X-rays, so your doctor may X-ray both elbows, to compare them. Often, they'll also X-ray above and below the elbow, to make sure there are no other injuries, like a broken wrist. Very occasionally, they may send your child for other imaging, such as a CT scan (which shows complex breaks more clearly) or MRI scan (which shows any soft tissue injuries).